I know this is a strange topic for July 4th, but here goes anyway. Given the recent G8 and G20 meetings, Canada is on our minds somewhat more than is usually the case (and even then, maybe not so much), so I thought I would take the opportunity to review recent events there. On this July 4th, Canada is looking like the country that does everything right. Canadians are in one sense intrinsically modest (though of course we can think of many counter-examples, including my coauthor from Winnipeg), but they also tend to think of the country south of the border as populated by gun-toting lunatics who treat their disadvantaged badly - a place one would rather not be. But how has Canada been doing? First, let's look at the recent path of real GDP relative to the United States. What you see here, in the first chart, is that the recent recession was not so different in Canada relative to the US, but the turning point in real GDP came later in Canada, the recession was not quite as deep, and the rebound has been faster. Labor (or labour, for Canucks) market behavior (behaviour) has been quite different however, as we see in the second chart. 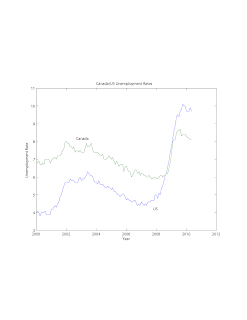 For various reasons (unemployment insurance and sectoral/regional variation), the unemployment rate tends to be higher in Canada as you can see up to about the end of 2007. However, the increase in the unemployment rate in percentage points in the United States from the most recent trough to the most recent peak was more than twice what it was in Canada, and the Canadian unemployment rate is now almost 2 percentage points lower. Behavior in the housing market has also been dramatically different from US experience, as shown in the third chart which depicts housing starts in the two countries. 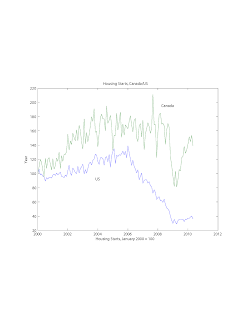 While the US has experienced a long decline in housing starts since 2006, with the current level of starts at about 40% of what it was in 2000, Canadian housing starts have rebounded from a short-lived drop in the recession to a level 40% higher than in 2000. In terms of the state of government finances, Canada stands out among highly-developed economies. 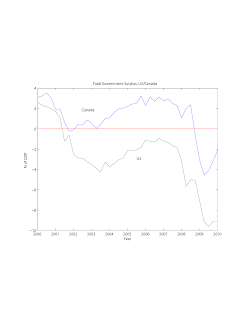 In the last chart, we show the total government surplus as a percentage of GDP in the US and Canada. 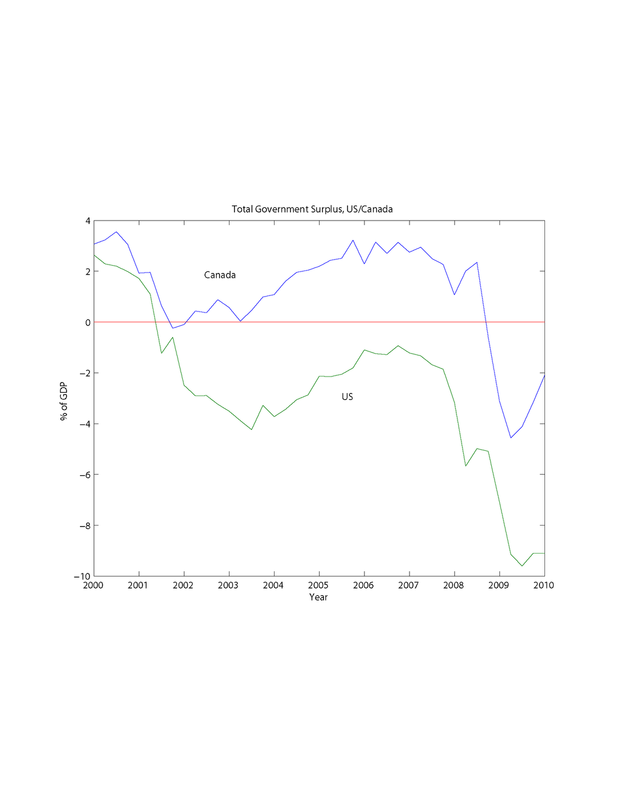 Here, note that the Canadians ran surpluses until the recent recession, with the current deficit standing at about 2% of GDP. Of course we all know about recent US experience. Now, Canada does not seem to be consistent with any of the narrative threads I am familiar with in the United States. If the Tea Party people were correct, a country with generous social insurance, including government-provided health care, should not be doing well, and certainly should not be capable of being fiscally responsible. If the Krugmaniacs were correct, Canada should not be bouncing back from the recession with such a low unemployment rate without a much more heavy dose of Keynesian stabilization policy. The experience of Canada and the US demonstrates how government matters. When a financial system gets off on the right foot initially, as Canada's did,, when the government regulates its financial system appropriately, and when the government is fiscally responsible, things go well. When those things don't happen, look out. Financial crises and generally bad economic conditions not only lead to hardship which is much more severe for some than for others, but also give us potential calamities in economic policymaking. Central banks and fiscal authorities panic, lunatic fringe movements gain traction, and economists seeking the vindication of their own ideas run around attacking each other. You say "If the Krugmaniacs were correct, Canada should not be bouncing back from the recession with such a low unemployment rate without a much more heavy dose of Keynesian stabilization policy." Could we get a citation on this? 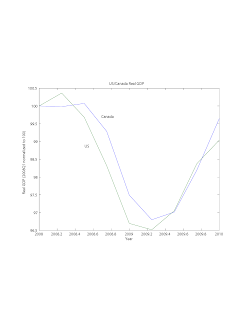 I don't recall Krugman or anyone else associated with him saying that Canada needed a much heavier dose of e.g. stimulus, particulary since recent developments in economy have become clear. The argument (Krugman could make) is actually quite simple: Canada did not have a severe financial crisis, nor (arguably) did it truly reach the zero bound of monetary policy. One might add, for flavour, that there was no collapse in either the residential housing or commercial property markets (with all the uncertainty, wealth effects and sticky-price behaviours that may or may not be specific to those markets, choose your poison). On financial sector, government efforts and/or prior regulation seem to have stopped an external event from creating a full-blown domestic crisis. In addition, based on his published record, Krugman would likely praise the floating exchange mechanism (vs. e.g. Eurozone), and running responsible fiscal policy during the previous years. Hence, the smaller stimulus and monetary policy appears to have been enough to respond. There's not much here that I see that contradicts Krugman. Why does Krugman bark at Germany for being so austere? Why not Canada, since that's the USA's largest trading partner? Are you even making an attempt to read Krugman? Seriously, why is he barking at Germany instead of Canada? Perhaps because Germany's current account surplus is still running 5% of GDP, or just less than $200 bln annually (and Canada's is a _deficit_ of 1.9%)? And perhaps because the largest economy in the Eurozone, a fixed exchange rate club, is so out of whack with all the others? And going back to your original post, you've really not said anything new about Krugman's position on Canada or stimulus, but just come up with a different reason to criticise him. Krugman has been quite specific with respect to the US and EU that he believes they are close to deflationary policies, partly for political reasons, in peculiar economic circumstances (possible liquidity trap). Those political and economic circumstances do not obtain in Canada (for many reasons, including floating exchange rate, better regulation, and willingness and capacity of government to do stimulus - in spite of ideological/party lines). these tips and graph will help the marketers too.